Thank you for purchasing products! Our motivation comes from your satisfaction. The miracast dongle wireless display adapter and multimedia display receiver (Airplay, WLAN, DLNA) can transfer your pictures, audio files and videos from your iPhone, Android Smartphone / Tablet to a HD TV, monitor or beamer via a WLAN connection. With this product, you can easily share high-resolution media files with friends and family. The adapter is perfect for office and school presentations (Powerpoint, Excel, Word, PDF and images from the smartphone, tablet to HD TV or beamer). 4.Use the 5G WLAN technology to avoid delays or buffering. 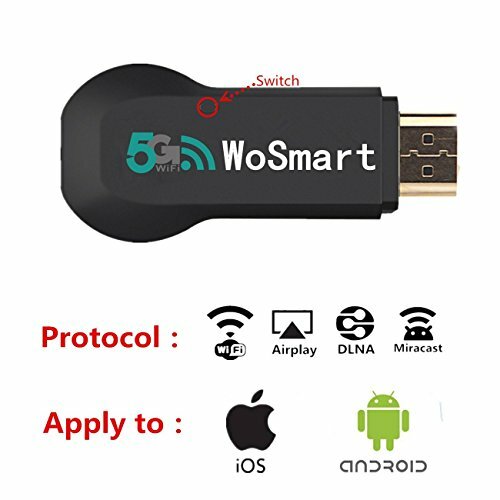 5.Easy setup: simply plug the stick into your HD TV and connect it to your WLAN. No additional app or driver on your smartphone or tablet is required. Please make sure your smartphone or tablet Miracast / DLNA is compatible before you buy the product. Please read the operating instructions carefully. For a certain group of people, the use of the system can be cumbersome at first. Please be patient with us. An instruction Manual has been packed, Any issues of the items or error occurs, kindly contact us by email, Our after-service will response in 24 hours. If you have any questions about this product by WoSmart, contact us by completing and submitting the form below. If you are looking for a specif part number, please include it with your message.